Have you always wanted to smash a beer bottle over someone's head like they do in bar fights in the movies? Well, now you can with your very own collection of movie grade SMASHProps Breakaway Bottle Props. 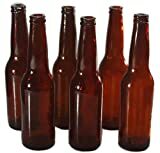 This set of realistic breakaway bottles includes 3 amber beer bottles, 3 green beer bottles, 2 Bordeaux wine bottles, 1 blue vodka bottle, 1 clear vodka bottle, 1 amber Scotch whiskey bottle, 1 green Champagne bottle, and self-adhesive brand labels for all. The faux bottles are crafted from a trade secret formulation of materials that are non-toxic, recyclable, and safe - no sugar is used. Great for making movies, performing in theatre plays, playing it safe in barroom brawls, or just pulling some fun pranks.